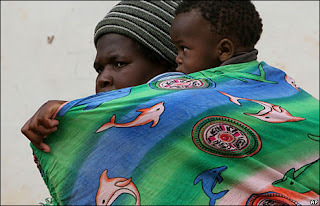 A Malawian woman wraps her child on to her back in a South African squatter camp north of Johannesburg on Friday after a week of deadly attacks against foreigners.. .
... 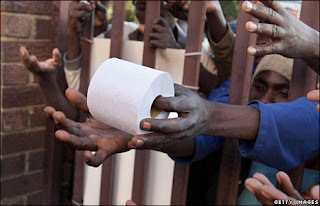 The day before, displaced Mozambicans in Johannesburg reach for relief aid through a gate in the suburb of Primrose as they wait to be repatriated from South Africa. 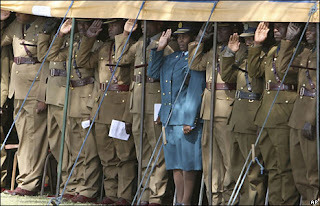 On Wednesday, Zimbabwean police salute President Robert Mugabe at their graduation ceremony in the capital, Harare. 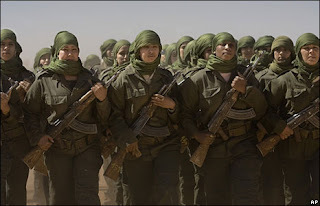 Women from the Polisario Front - the movement demanding independence for Western Sahara from Morocco - march in a parade on Tuesday to mark the group's 35th anniversary. 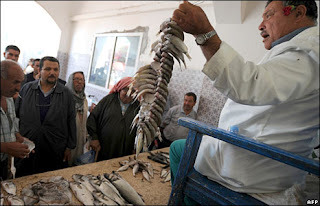 Senegalese actress Issa Maija arrives at an event on Thursday in Cannes during the French town's 61st film festival. 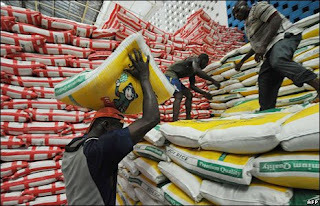 On Wednesday, workers handle sacks of imported rice at a warehouse in the Ivorian city of Abidjan where the price of rice has risen 50% in recent months prompting demonstrations. 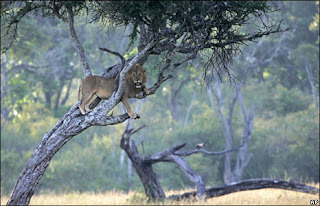 A lion surveys the plains of the Maasai Mara game reserve in Kenya from up a tree on Monday.